I have been convinced, for some years now, that cats tread the line between two worlds: the one we see, and the one we cannot … that a strange cat is a harbinger. Even as I step out onto my porch every morning to feed the two wildling cats that arrived out of nowhere last summer, that refuse to allow me to pet their tuxedo-patterned fur, I step carefully, gingerly, unless I slip over some unseen line between my safe bubble and into an invisible, dangerous terrain. It seems as though my suspicions are not unfounded. 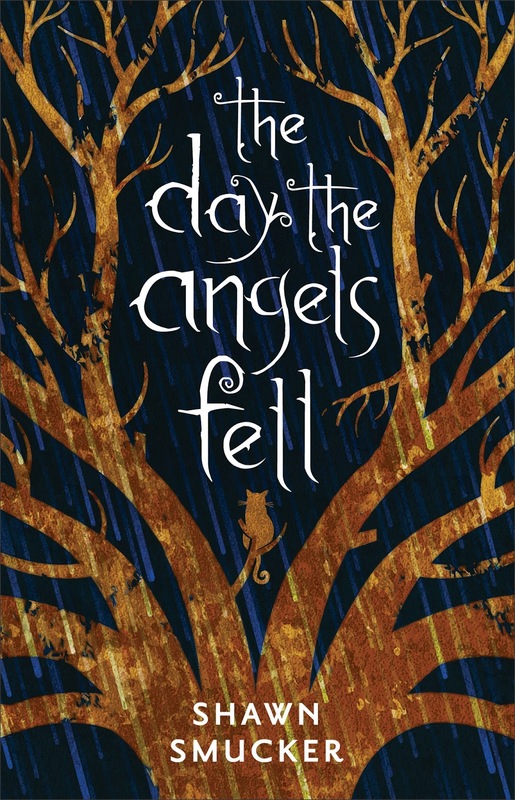 I stroke the lush cover of “The Day the Angels Fell,” and my hand instinctively pauses over the silhouette of the mysterious cat perched in the palm of the Lightning Tree imprinted on the dust cover. A shiver runs down my spine as the looming darkness beyond the tree limbs seeps through my fingertips. 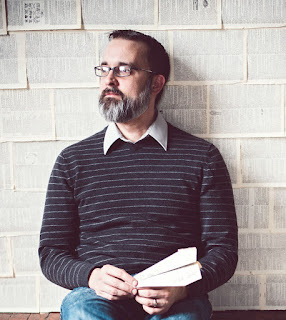 If I strain my ears hard enough, I can hear the distant pitter patter sound of fat, summer raindrops falling against the bark of the tree that holds the cat beneath my hand, on the cover of Shawn Smucker’s marvelous book. A sip of hot tea chases away the chill that has inched its way up my arm and has wound around my heart, where an old scar marks the loss of a dearest loved one- my father. 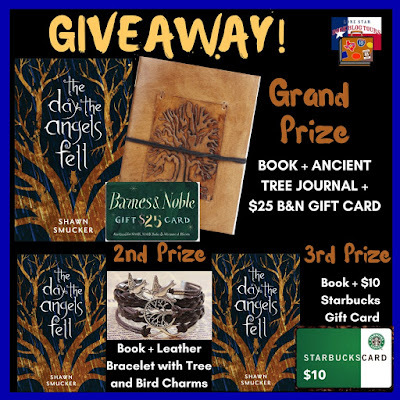 The loss, so long ago, had vanquished a part of me, leaving me longing for the return of the Tree of Life just like Smucker’s main character, Sam. But wasn’t this book supposed to be fiction? A fairytale? After having read each and every lavish sentence in this book, I’m convinced, without a shadow of a doubt, that Smucker is telling a true story concealed within a fable. 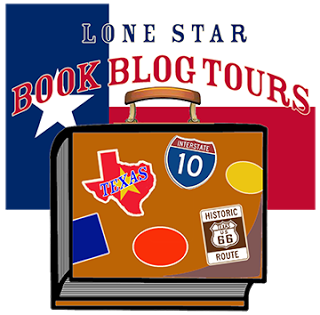 This story begins in the present, with Sam as an old man. 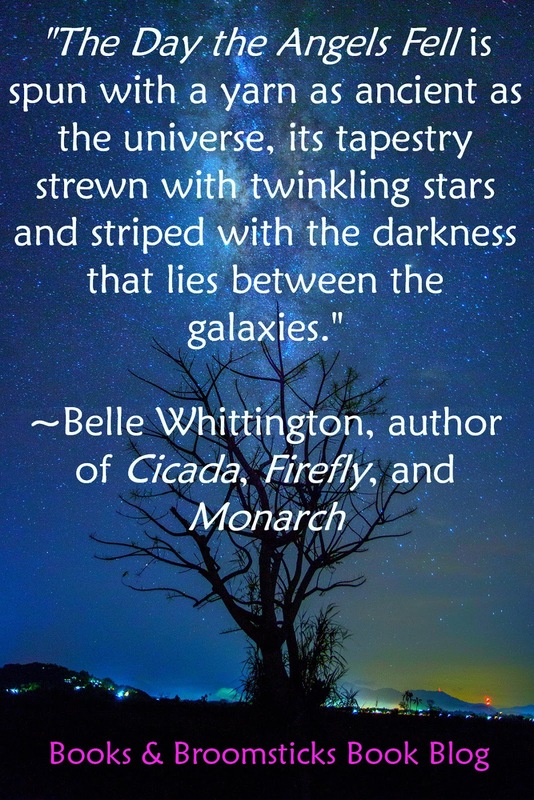 This story begins with a weight of mystery that pulls the reader down into the depths of a story as deep as eternity itself and as wide as the space between the stars. There is darkness here, so tread softly. But there is light in the bonds of family, there is strength in friendship, so carry your sword bravely. For there is a battle to be waged, and only the bonds of friendship, the ties of love, and the faith that all will turn out as planned, will see you through. Just remember to listen to that small voice within. 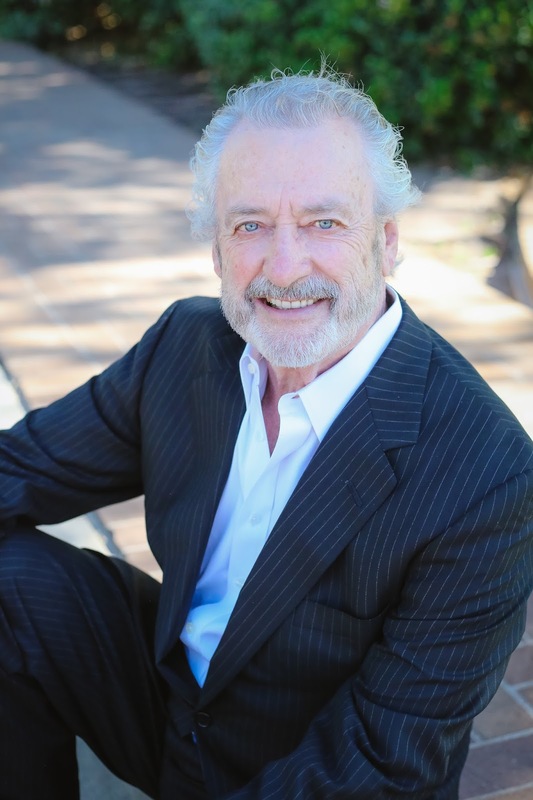 It will help you discern the difference between an angel of light and of darkness. This is important, so do not take it lightly! Though the tale begins in Sam’s present, the reader is soon pulled into the distant past … into Sam’s childhood … to when his mother dies in a very mysterious incident involving lightning and a strange cat. I quickly pull my hand away from the cover of the book, for it happened right there where the cat is perched in the Lightning Tree. As I type this, the temptation of spilling all the glorious details of this story tears at my fingers, willing them to reveal all the secrets that lay hidden in this book that reminds me so much of C.S. 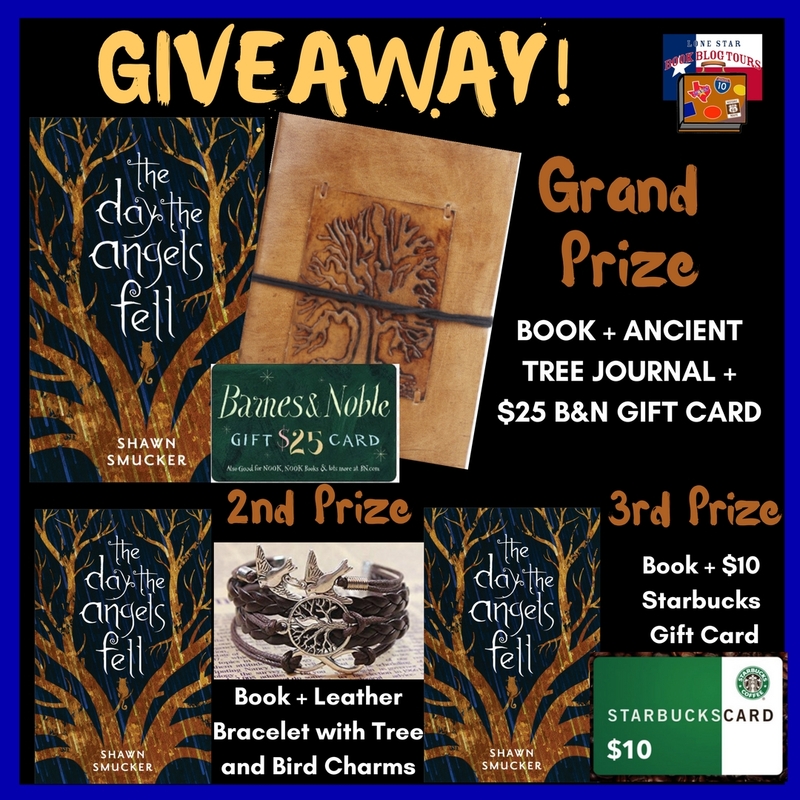 Lewis’ “The Lion, The Witch, and the Wardrobe.” Oh, how I wish to reveal who the real hero of this story is and how happy I was, as I turned the very last page of the book, to discover that “The Day the Angels Fell” is not the end of Sam’s story. 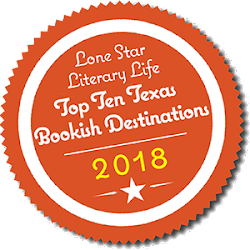 For there is a sequel coming in 2018, and I have already added it to my mental “TBR” bookshelf. 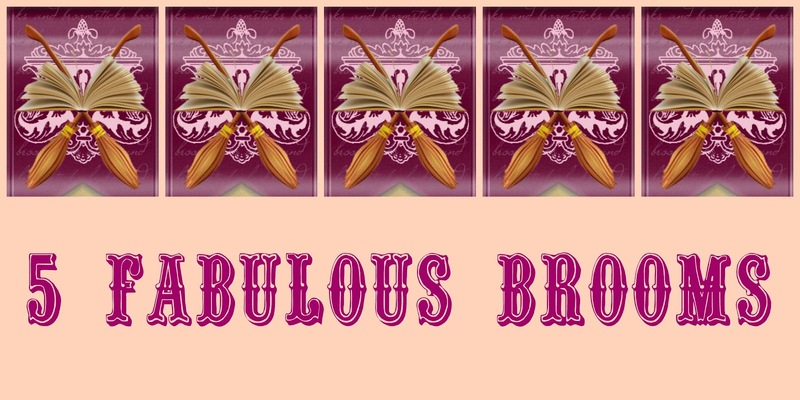 I invite you to join me in diving into Smucker’s book, for you will discover that as soon as you turn back the front cover, the carefully-spun tale (it is a true story, I assure you!) will pull you under the dark surface and into an ancient tale of good versus evil. But I will leave it up to you to decide whether or not death is a gift. 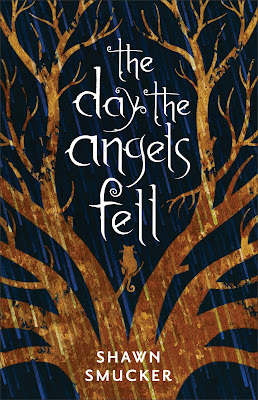 “The Day the Angels Fell” is the best book I’ve read in a very long time. 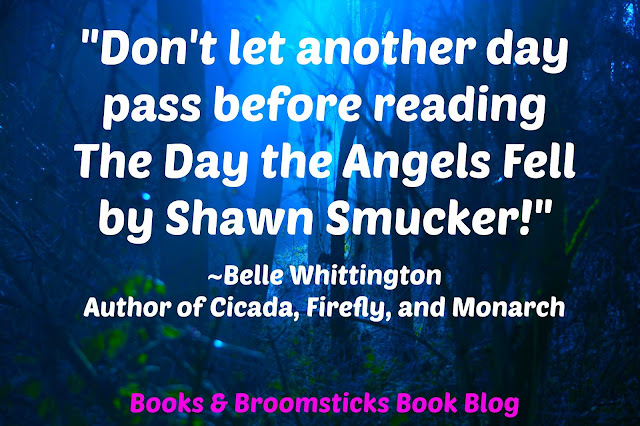 Smucker casts out his line, reels you in, then casts the line out again until you are hooked. Within these covers reside ancient monsters, battling angels, and a tale as old as time. 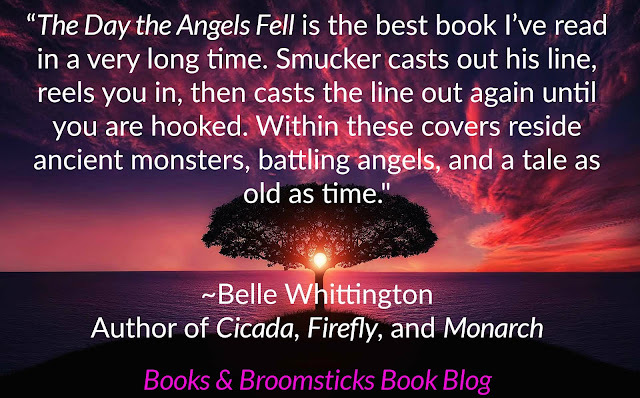 “The Day the Angels Fell” is spun with a yarn as ancient as the universe, its tapestry strewn with twinkling stars and striped with the darkness that lies between the galaxies. The wildling cats are tapping against the window on my front porch, calling for me to deliver their breakfast kibble with their mysterious short mews. My dog barks at the front door, her hackles raised, and she stands between me and the front door as if protecting me from some unseen force that threatens to catch me away on a wild adventure. 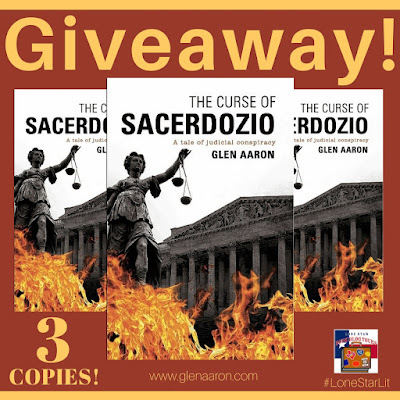 Don’t let another day pass before reading this book! I hereby grant “The Day the Angels Fell” 5 Mysterious Foreboding Brooms! 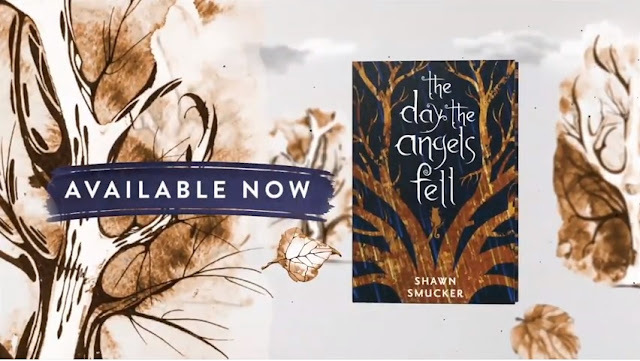 "The Day the Angels Fell" by Shawn Smucker! When Harvard Law School graduate Tommy Jon is chosen from a sea of applicants to clerk for Supreme Court Justice Anton Sacerdozio, he's honored and excited by the opportunity. Tommy is the first Jicarilla Apache to ever graduate from Harvard Law and the clerkship seems like a dream come true. 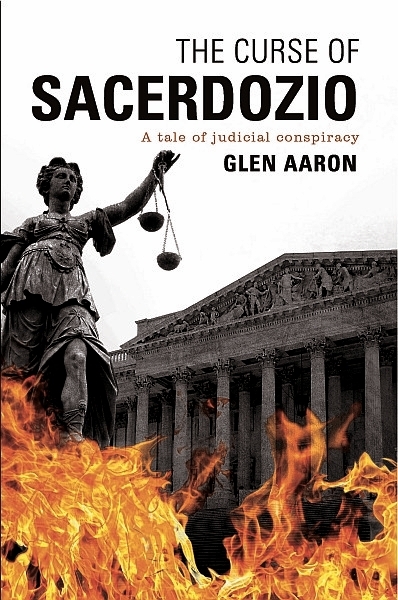 But when he falls in love and impregnates another clerk and she chooses to get an abortion, Sacerdozio's dark side surfaces. Then, the justice is found dead - murdered and left floating in a hot mineral pool in Texas - and Tommy becomes the number one suspect. 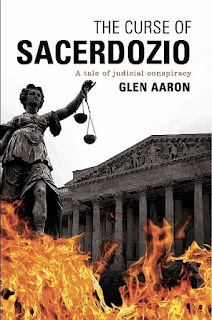 And so begins The Curse of Sacerdozio: A tale of judicial conspiracy, the first exciting book in The Supremes series from author and trial attorney Glen Aaron.